Not a stinky cheese but a rare French hound, the Basset Bleu de Gascogne is a cousin to the Basset Hound, with whom he shares a low-slung body and baritone voice. 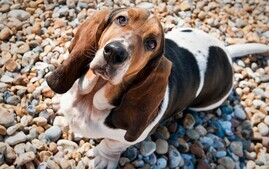 The Basset Bleu typically loves to hunt and tends to be affectionate and happy at home. This medium-sized dog has a short, dense coat that isn’t difficult to groom, but he does shed and is likely to have a “houndy” odor. 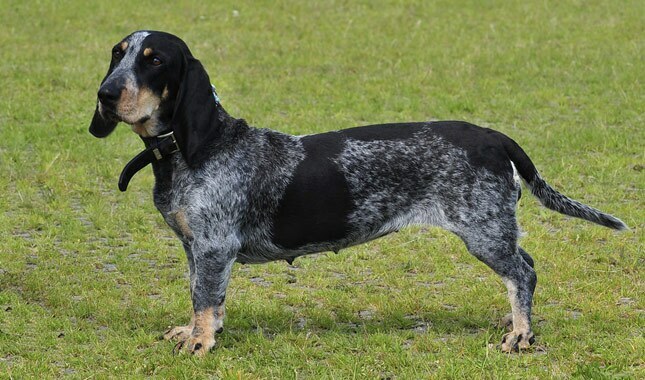 The Basset Bleu is one of the rarest, if not the rarest, of the French hound breeds. In English, his name translates to Blue Gascony Basset. In his native country of France, the Basset Bleu de Gascogne is one of six types of basset (a reference to their short stature) hounds. 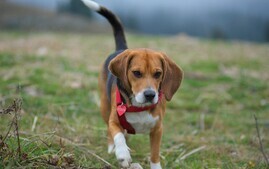 He is a lively, active and agile dog who tends to enjoy hunting on his own or as part of a pack. As befits a member of the hound family, he has a keen sense of smell and can usually be found with his nose to the ground. The Basset Bleu typically loves being with his people, indoors or out, but he tends to be best suited to a home where he can enjoy the outdoors with active people who take him hunting or compete with him in dog sports such as nose work or tracking. With appropriate socialization and supervision, he generally does well with children of any age, thanks to his medium size and easygoing nature. He also tends to get along well with other pets if brought up with them, although rabbits may find him hot on their tail. 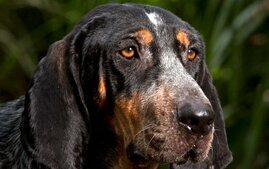 How can you tell the difference between the Basset Bleu and the Basset Hound? 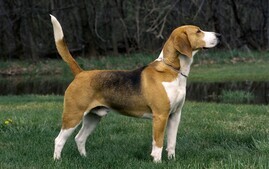 The Basset Bleu has a lighter build, his skin fits more tightly to the body and his legs appear slightly longer. In height, he reaches a maximum of 15 inches at the shoulder, rather than the 14 inches called for by the Basset Hound standard. The Basset Bleu’s mottled black-and-white coat gives a slate-blue effect, hence the word “bleu” in his name. 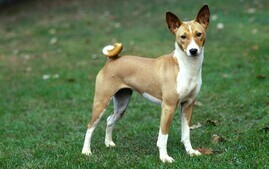 The coat usually has black patches, plus tan markings above the eyes, on the cheeks and lips, inside the ears, on the legs and beneath the tail. A white blaze on top of the head may include an oval black spot in the center. 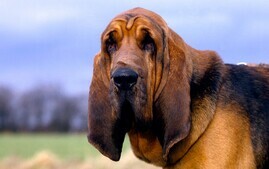 The Basset Bleu has a narrow, elegant head with very long ears that fold inward. The ears contribute to the Basset Bleu’s scenting ability by sweeping scent up toward the nose. The Basset Bleu is an old breed, dating to the 14th century. He hails from the region of Gascony in southwest France, where he was bred down in size from the Grand Bleu de Gascogne and used to hunt small game, such as rabbits. The breed faced extinction by the 1890s, but in the early 20th century, a man named Alain Bourbon came to the breed’s rescue. It’s likely that he ensured its survival by crossing the few remaining dogs with the Basset Saintongeois and the Grand Bleu de Gascogne. In Europe, the Basset Bleu is recognized by the Federation Cynologique Internationale. 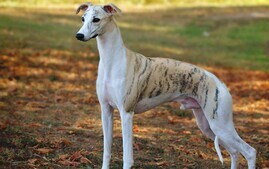 The United Kennel Club recognized the breed in 1991. 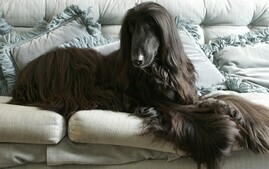 A few people in the United States have the breed, but it is rarely seen outside of France. The Basset Bleu is a dog with unique and engaging qualities. He’s typically friendly, outgoing and eager to please and should not be aggressive or shy. In the field, he generally sticks close to the hunter or ranges out only a moderate distance, depending on the game he’s tracking. Afterward, he’s usually content to sleep in a favorite spot in the house. If he shares your bed, he is likely to hog the covers. He’s typically well-suited to life with a family who will take him hunting and who will love the song of a hound in full voice. Neighbors might not always appreciate the Basset Bleu’s voice, but he may charm them by flopping over for a good belly rub. The breed comes in a full spectrum of personalities. Some love to run around and chase a ball, while others consider themselves to be lap dogs. In general, however, they are congenial dogs, playful and social, with a moderate activity level. Healthy Basset Bleus tend to enjoy long walks, hikes or other activity, especially if they have plenty of opportunities to sniff, but they won’t run you off your feet and will usually happily join you on the sofa for an afternoon of vegging out in front of the television. That said, like all scenthounds, the Basset Bleu will follow a trail to the exclusion of all else. That’s great when you’re taking him hunting; not so much if he escapes from your yard and wanders off. A securely fenced yard is a must. Because he’s a pack dog, the Basset Bleu generally enjoys the company of other animals. He tends to get along fine with other dogs (and even cats, if he's brought up with them). 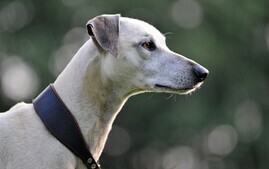 Hounds tend to be independent, with a mind of their own (read: stubborn). This can make them a challenge to train, but it doesn’t mean they’re stupid. You will feel a great sense of accomplishment if you are patient enough to train a Basset Bleu. He can learn; you just have to find his motivation, which is often going to be food. Start training your Basset Bleu puppy the day you bring him home. He is capable of soaking up everything you can teach him. Don’t wait until he is 6 months old to begin training, or you will have a more headstrong dog to deal with. If possible, get him into puppy kindergarten class by the time he is 10 to 12 weeks old. Be aware, however, that many puppy training classes require certain vaccines (such as the one for kennel cough) to be up-to-date, and many veterinarians recommend limiting exposure to other dogs and public places until puppy vaccines (including rabies, distemper and parvovirus) have been completed. In lieu of formal training, you can begin training your puppy at home and socializing him among family and friends until puppy vaccines are completed. The perfect Basset Bleu doesn’t spring fully formed from the whelping box. He’s a product of his background and breeding. Look for a puppy whose parents have nice personalities and one who has been well socialized from an early age. The Basset Bleu is a generally healthy breed, with an expected life span of 10 to 14 years. Genetic problems appear to be rare in this breed; however, all dogs have the potential to develop genetic health problems, just as all people have the potential to inherit a particular disease. Run — don’t walk — from any breeder who does not offer a health guarantee on her puppies, who tells you that the breed is 100-percent healthy and has no known problems or who tells you that her puppies are isolated from the main part of the household for health reasons. A reputable breeder will be honest and open about health problems in the breed and the incidence with which they occur in her lines. The Basset Bleu is a deep-chested breed. That means he may be prone to a condition called gastric dilatation volvulus, also known as bloat. You may want to consider having the stomach “pinned” (a surgery called gastropexy) when you have the dog spayed or neutered to help prevent the problem. Some Basset Bleus may develop back problems as they age. This may be something to consider if you have stairs in your home. Careful breeders screen their breeding dogs for genetic disease and breed only the healthiest and best-looking specimens, but sometimes Mother Nature has other ideas and a puppy develops one of these diseases despite good breeding practices. Advances in veterinary medicine mean that in many cases, the dogs can still live good lives. If you’re getting a puppy, ask the breeder about the ages of the dogs in her lines and what caused their deaths. If a breeder tells you she doesn’t need to do those tests or her dogs don’t need health certifications because she’s never had problems in her lines or that her dogs have been vet-checked or gives other excuses for skimping on the genetic testing of dogs, walk away immediately. Remember that after you’ve taken a new puppy into your home, you have the power to protect him from a common canine health problem: obesity. Keeping a Basset Bleu at an appropriate weight is one of the easier ways to help ensure a healthier dog for life. The Basset Bleu has a short, thick coat that is easy to groom. Give it a good brushing once or twice a week to help remove dead hair and keep the coat shiny. He may also be prone to ear infections. Keep his ears dry and check them weekly to make sure they’re not red or smelly. If they look dirty, wipe them out with a cleanser recommended by your veterinarian. Bathe your dog as needed. That may be weekly, monthly or quarterly, depending on how dirty he gets and your toleration of the houndy odor, often described as musty. The rest is basic care. Trim the nails every week or two or as needed. Brush the teeth often (daily is best) — with a vet-approved pet toothpaste — for good overall health and fresh breath. Selecting a respected breeder is a great way to find the right puppy. A good breeder will match you with the right puppy and will, without question, have done all the health certifications necessary to screen out health problems as much as possible. She is more interested in placing pups in the right homes than making big bucks. Good breeders will welcome your questions about temperament, health clearances and what the dogs are like to live with and will come right back at you with questions of their own about what you’re looking for in a dog and what kind of life you can provide for him. A good breeder can tell you about the history of the breed, explain why one puppy is considered pet quality while another is not and discuss what health problems affect the breed and the steps she takes to avoid those problems. To find one of these dogs, you may need to visit France. First, consider brushing up on your French and seeking out online forums, such as the Club du Bleu. That’s a good way to meet people involved with the breed who may be able to help you find a puppy or decide if the breed is right for you. If you find a breeder in North America, choose one who is active in her national breed club and a local club, too, if possible. She should regularly participate with her dogs in some form of organized canine activity, such as conformation showing, obedience or other dog sports or therapy dog programs. She should sell her puppies with written contracts guaranteeing she will take the dogs back if at any time during their lives the owners cannot keep them. Avoid breeders who seem interested only in how quickly they can unload a puppy on you and whether your credit card will go through. Also bear in mind that buying a puppy from a website that offers to ship your dog to you immediately can be a risky venture, as it leaves you no recourse if what you get isn’t exactly what you expected. Put at least as much effort into researching your puppy as you would into choosing a new car or expensive appliance. It could save you money and frustration in the long run. A lot of reputable breeders have websites, so how can you tell who’s good and who’s not? Red flags include puppies always being available, multiple litters on the premises, having your choice of any puppy and the ability to pay online with a credit card. Quickie online purchases are convenient, but they are almost never associated with reputable breeders. Whether you’re planning to get your new best friend from a breeder, a pet store or another source, don’t forget the adage, “Let the buyer beware.” Disreputable breeders and facilities that deal with puppy mills can be hard to distinguish from reliable operations. There’s no 100-percent guaranteed way to make sure you’ll never purchase a sick puppy, but researching the breed (so you know what to expect), checking out the facility (to identify unhealthy conditions or sick animals) and asking the right questions can reduce the chances of heading into a disastrous situation. And don’t forget to ask your veterinarian, who can often refer you to a reputable breeder, breed rescue organization or other reliable source for healthy puppies. 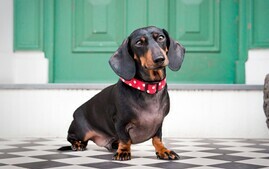 And before you decide to buy a puppy, consider whether an adult Basset Bleu might better suit your needs and lifestyle. Puppies are loads of fun, but they require a lot of time and effort before they grow up to become the dog of your dreams. An adult Basset Bleu, if one is available, may already have some training and will probably be less active, destructive and demanding than a puppy. With an adult, you know more about what you’re getting in terms of personality and health, and you may be able to find adults through breeders or shelters. If you are interested in acquiring an older dog through breeders, ask about purchasing a retired show dog or if they know of an adult dog who needs a new home. 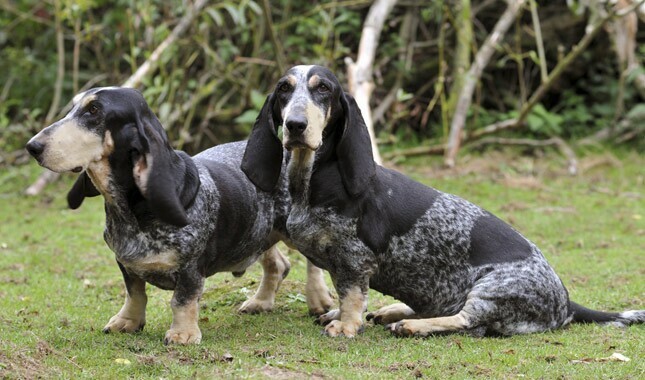 Bear in mind that the Basset Bleu is a rare breed and few are available in this country. It is unlikely that you will find one in a shelter or through a rescue group. If you want to search, however, here’s how to get started. Sites like Petfinder and Adopt-a-Pet.com can have you searching for a Basset Bleu in your area in no time flat. AnimalShelter.org can help you find animal rescue groups in your area. Start talking with all the pet pros in your area about your desire for a Basset Bleu. That includes vets, dog walkers and groomers. When someone has to make the tough decision to give up a dog, that person will often ask her own trusted network for recommendations. Many breed clubs have rescue organizations devoted to caring for and placing homeless dogs. The great thing about breed rescue groups is that they tend to be very upfront about any health conditions the dogs may have and are a valuable resource for advice. They may also offer opportunities to foster a dog if you are an experienced dog owner. Has he ever bitten or hurt anyone? Wherever you acquire your Basset Bleu, make sure you have a good contract with the seller, shelter or rescue group that spells out responsibilities on both sides. Petfinder offers a Bill of Rights for Adopters that helps you understand what you can consider normal and appropriate when you get a dog from a shelter. In states with puppy lemon laws, be sure you and the person you get the dog from both understand your rights and recourses. Puppy or adult, breeder purchase or rescue, take your Basset Bleu to your veterinarian soon after adoption. Your veterinarian will be able to spot problems and will work with you to set up a preventive care schedule.